The leading gaming events in the Eastern European region are launching a new media campaign for the upcoming editions this autumn. 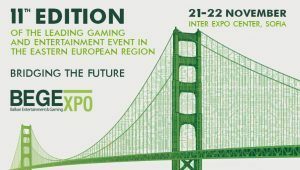 The new decade for BEGE and EEGS, which starts in 2018 with the 11th edition of the events, will continue supporting the development of the region as a technology hub with input from and by an assembly of representatives from the gaming industry from 20-22 November at Inter Expo Center, Sofia, Bulgaria. Trying to sum up our development, we came to a few conclusions: our visitors have doubled in size since 2008, the exhibition space at BEGE has increased three times and EEGS currently covers more than 20 jurisdictions! Looking upon those achievements, Milena Tsankarska, Marketing & Sales Manager of BEGE shared: “Through the years we have tried to not only make BEGE a center, where international companies from the industry can meet and connect, but also keep up with the trends and always come up with new and better initiatives. As part of these efforts we launched the first contest for startup companies in the region three years ago. Last year we set up the Innovation zone and the Sales Pitch corner, giving the exhibiting companies even better opportunity to present their best”. Since last year BEGE is working hard to extend its scope, reach and inspire more innovative companies, thus contributing to the development of the industry in the region and building better future for it. This year, among the big names you see traditionally at BEGE, such as Novomatic, Ainswort, Casino Technology, EGT, Suzohapp, BetConstruct, Interblock, Merkur Gaming, APEX, Alfastreet Trade BG, IGT, Innovative Technology, you will also see StatSoft Bulgaria, as well as new participants like Digitain, G-Digital, DLV and more. Currently all start-up companies from the gaming and entertainment field can apply to take part in the Startup zone and participate in the Gaming Startup Challenge – 3.0 by submitting their application on the website. You’d better start preparing by booking your hotel for Sofia this November. The floorplan still has available space, which you can take advantage of and become part of the new decade of the leading gaming and entertainment events of Eastern Europe.